If you have taken photographs or video of the Sunday Stroll or London Friday Night Skate and would like them to our web site, all you have to do is upload them to Flickr and tag them. You will need an account with Flickr but these are free of charge and easy to setup. * Upload your photos to Flickr and tag them ‘yyyymmdd’ according to the date of the skate. For example, ‘20080427’ is the 27th of April 2008. 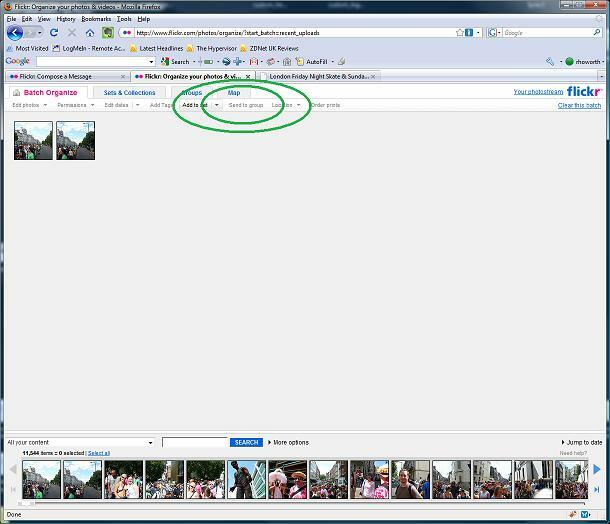 * Use the “Organise – Most recent upload” menu to go to Flickr’s batch organiser, then use the “Send to group” buttonÂ to send them to the LFNS group. This will send them to our Flickr group, which is how we find them and add them to our site. * The first time you send us some photos you will need to join the LFNS group on Flickr. If you’re already sending pics – thanks! Don’t forget, you own the copyright to your photos even if they are on our site. Link to our Flickr group. 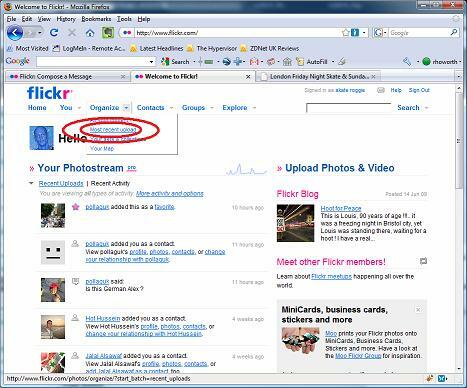 Use this menu option (highlighted by the red circles) to get to Flickr's batch organise page. Use the "Send to group" button to add your pictures to our web site. This entry was posted on Friday, November 28th, 2008 at 23:45. You can follow any responses to this entry through the RSS 2.0 feed. Responses are currently closed, but you can trackback from your own site.